16.20.055 Special exemption for prevention or mitigation of Pajaro River/ Salsipuedes Creek flooding. 16.20.080 Approval limitations and conditions. 16.20.110 Diking, dredging and filling. 16.20.140 Design standards for excavations. 16.20.150 Design standards for fills. 16.20.160 Cut and fill slope setback. 16.20.170 Design standards for drainage facilities and terraces. 16.20.180 Design standards for rural private roads and driveways. The purpose of this chapter is to safeguard health, safety, and the public welfare; to minimize erosion and the extent of grading; to protect fish and wildlife; to protect the watersheds; to ensure the natural appearance of grading projects; and to otherwise protect the natural environment of Santa Cruz County. [Ord. 3321 § 1, 1982; Ord. 2500, 1977]. This chapter sets forth rules and regulations to control all grading, including excavations, earthwork, road construction, dredging, diking, fills and embankments; establishes the administrative procedure for issuance of permits; and provides for approval of plans and inspections. This chapter shall apply to both private and public activities including those of the County and other such governmental agencies as are not exempted by State or Federal law. [Ord. 4166 § 1, 1991; Ord. 4027 § 3, 1989; Ord. 3599 § 1, 1984; Ord. 3321 § 1, 1982; Ord. 2500, 1977]. Any revision to this chapter which applies to the Coastal Zone shall be reviewed by the Executive Director of the California Coastal Commission to determine whether it constitutes an amendment to the Local Coastal Program. When an ordinance revision constitutes an amendment to the Local Coastal Program, such revision shall be processed pursuant to the hearing and notification provisions of Chapter 13.03 SCCC, and shall be subject to approval by the California Coastal Commission. [Ord. 3321 § 1, 1982]. “Agricultural grading” means any grading which takes place on land designated on the County’s agricultural resource maps for exclusive agricultural use as specified in SCCC 16.50.040; provided, however, that agricultural grading does not include any grading on such lands connected with the construction of access roads or building sites; except greenhouse sites. Agricultural grading does not include the movement of earth defined as agricultural work in SCCC 16.20.050(I). “Bedrock” means the in-place solid, undisturbed material either at the ground surface or beneath superficial deposits of gravel, sand or soil. “Bench” means a relatively level step excavated into earth material. “Civil engineer” means a professional engineer registered in California to practice civil engineering. “Clearing” means the removal of vegetation down to bare soil, whether by hand, machine or any other method. “Compaction” means the densification of earthen solids. “Contractor” means any person licensed in the State of California to do grading as defined by State law. “Diking” means construction of an earthen dam to control or confine water. “Drainage course” means a natural or manmade channel which conveys storm runoff either year-round or intermittently. “Dredging” means scooping or digging of earth material from the bed of a body of water. “Earth material” means rock, natural soil, sand or combination thereof. “Engineering geologist” means a professional geologist registered in the State of California to practice engineering geology. “Erosion” means the wearing away of the ground surface as a result of movement of wind, water or ice. “Excavation” means the mechanical removal of earth material, or a cavity formed by cutting, digging or scooping. “Existing grade” means the grade prior to grading. “Fill” means the deposition of earth or other material by artificial means for any purpose, for any length of time, including the stockpiling of material, or the conditions resulting therefrom. “Finish grade” means the final grade of the site which conforms to the approved plan. “Grade” means the vertical location of the ground surface, or the degree of rise or descent of a slope. “Grading” means excavating, or filling, dredging, diking, prospecting, exploratory mining operation or combination thereof. 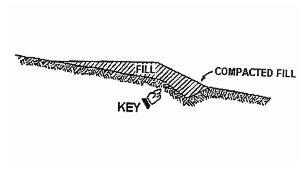 “Key” means a designed compacted fill placed in a trench excavated in undisturbed earth material or rock beneath the toe of a proposed fill slope for the purpose of developing a shearing resistance (see Figure 1). “Land disturbance” means clearing, excavating, grading or other manipulation of the terrain. “Littoral cell” means a continuous section of shoreline within which sand moves in a prevailing direction in response to seasonal current. “Permittee” means the property owner, or any contractor or other person undertaking grading upon the property of the property owner, pursuant to a permit granted according to the provisions of this chapter. “Planning Director” means the Director of the Planning Department or a designated employee. (6) Lands within an arroyo located within the urban services line, or the rural services line. “Road gradient (percent)” means a vertical rise multiplied by 100 and divided by horizontal run. “Security” means a cash deposit, time certificate of deposit or equivalent security acceptable to the County. “Site” means a parcel of land or contiguous combination thereof, where grading is performed or proposed. “Soil” means naturally occurring superficial deposits of earth material overlying bedrock. “Soil engineer” means a civil engineer, registered in the State of California, experienced and knowledgeable in the practice of soil engineering. (3) Has a channel, free of soil and debris. “Terrace” means a relatively level step constructed in the face of a graded slope for drainage and maintenance purposes. “Waterbreak” means a ditch, dike, dip or combination thereof, constructed to effectively divert water as an aid to erosion control. “Winter season” means October 15th through April 15th. [Ord. 4346 § 67, 1994; Ord. 3599 § 2, 1984; Ord. 3321 § 1, 1982; Ord. 2972, 1980; Ord. 2500, 1977]. (A) Planning Commission. All approvals for grading in excess of 8,000 cubic yards, or for which an environmental impact report was prepared, or for grading in excess of 1,000 cubic yards which is visible from a scenic corridor roadway, as designated in the Local Coastal Program Land Use Plan, shall be processed according to Chapter 18.10 SCCC, Level VI. (B) Planning Director. All other permits shall be processed according to Chapter 18.10 SCCC, Level III. (C) Subdivisions. The Public Works Director is hereby authorized and directed to enforce the provisions of this chapter for grading done within parcel map subdivisions for which improvement plans have been signed by the Public Works Director or within subdivisions for which a final map has been recorded or for property on which a tentative subdivision map has been approved and grading is permitted prior to recording of a final map. Grading permits are not issued by the Planning Director for subdivision work administered by the Director of Public Works. [Ord. 3636 § 1, 1985; Ord. 3438 § 1, 1983; Ord. 3321 § 1, 1982; Ord. 2500, 1977]. The following work is exempt from the provisions of this chapter; however, it remains subject to the riparian corridor protection ordinance (Chapter 16.30 SCCC), the County environmental review regulations (Chapter 16.01 SCCC), the erosion control ordinance (Chapter 16.22 SCCC), the geological hazard ordinance (Chapter 16.10 SCCC), the sensitive habitat protection ordinance (Chapter 16.32 SCCC), and the County Native American cultural sites ordinance (Chapter 16.40 SCCC). The following work may also be subject to other requirements imposed in County and State law. (A) Excavations. An excavation which does not exceed 100 cubic yards and which does not create a cut slope greater than five feet in depth. (B) Fills. A fill containing earth material only which is less than two feet in depth, is placed on natural terrain which has a slope flatter than five horizontal to one vertical, does not exceed 100 cubic yards on any one site, does not alter or obstruct a drainage course, and will not be used for structural support. (C) Basements, Footings. An excavation below finished grade for basements and footings of a building, retaining wall or other structure authorized by a valid building permit. This shall not exempt any fill as provided under subsection (B) of this section made with the material from such excavation, nor exempt any excavation having an unsupported height greater than five feet after the completion of such structure. (E) Refuse Disposal. Refuse disposal sites which are permitted and actually being controlled pursuant to other County regulations, and excavations for individual and community sewage disposal systems, made pursuant to permit. (F) Wells and Utilities. Excavations for wells or utilities. (G) Mining and Quarrying. Mining, quarrying, excavating, processing, stockpiling of rock, sand, gravel, aggregate or clay materials, pursuant to a County permit. (H) Soil Testing. Exploratory excavations under the direction of a soils engineer or engineering geologist where such excavation is to be returned to the original condition under the direction of such engineer or geologist within 45 days after the start of work. (J) Timber Harvesting. Work done pursuant to a valid timber harvesting permit. (K) County Public Works. Routine maintenance and other work undertaken by the County Department of Public Works that does not impact an environmental resource of hazardous or critical concern where designated, mapped and officially adopted pursuant to law by Federal or State agencies, or by the Santa Cruz County Board of Supervisors, or where identified through field or technical investigation. [Ord. 4496-C § 83, 1998; Ord. 3599 § 3, 1984; Ord. 3321 § 1, 1982; Ord. 2500, 1977]. 16.20.055 Special exemption for prevention or mitigation of Pajaro River/Salsipuedes Creek flooding. (3) The project has been subjected to environmental review with the County of Santa Cruz serving as the lead agency. [Ord. 4790 § 1, 2005; Ord. 4374 § 1, 1995]. (A) General. An application for a grading approval shall be submitted by the owner(s) of the property or agent when authorized in writing. The application shall be signed by the owner(s) of each site or their designated representative, as defined under SCCC 16.20.030. A civil engineer or other licensed professional authorized by State law shall prepare and sign the plans and specifications if grading will be in excess of 2,000 cubic yards. Special design requirements for dredging and diking shall be determined by the Planning Director. (B) The application shall be accompanied by all fees required by SCCC 16.20.120. (1) A statement as to the specific intentions or ultimate purpose for which the grading is being done. (2) General location of the proposed site. (3) Property lines and contours of the existing ground and details of terrain and area drainage. (4) Limiting dimensions, elevations or finish contours to be achieved by the grading, and proposed drainage channels and related construction. (5) Detailed plans of all surface and subsurface drainage devices, walls, cribbing, dams and other protective devices to be constructed with, or as a part of, the proposed work, together with a map showing the drainage area and the estimated runoff of the area served by any drains. The location of any ravines and drainage courses and the pathway of offsite drainage shall be indicated. (6) Location of buildings or structures on the property where the work is to be performed and the approximate location of buildings or structures on adjacent land owned by other owners which is within 15 feet of the property line or which may be affected by the proposed operations. (7) A statement of the quantity of excavation and fill. (8) Specifications, if required, shall contain information covering construction and material requirements. (9) An erosion control plan and erosion prevention measures for all surfaces exposed or expected to be exposed during grading activities, in accordance with the requirements of the erosion control ordinance (Chapter 16.22 SCCC) shall accompany every proposed grading plan. (10) Revegetation proposal for all surfaces exposed or expected to be exposed during grading activities. (11) Name and address of the owner(s). (12) Assessor’s parcel number(s) of the property on which the work is to be done. (13) Location of on-site trees. (14) When required by the Planning Director, each application for a grading approval shall be accompanied by supporting data consisting of a soil engineering report and/or engineering geology report. The soil engineering report shall include data regarding the nature, distribution and strength of existing soils; conclusions and recommendations for grading procedures; design criteria for corrective measures when necessary; and opinions and recommendations covering adequacy of sites to be developed by the proposed grading. The engineering geology report shall include an adequate description of the geology of the site, conclusions and recommendations regarding the effect of geologic conditions on the proposed development, and opinions and recommendations covering the adequacy of sites to be developed by the proposed grading. Recommendations included in the reports and approved by the Planning Director shall be incorporated in the grading plans and specifications. (15) When required by the Planning Director because it appears that the location of property line may be in question in connection with the proposed grading, a parcel survey or other boundary evidence deemed necessary by the Planning Director shall be provided. (D) Starting and Completion Dates. Each application for a grading permit shall state estimated starting and completion dates. [Ord. 3599 § 4, 1984; Ord. 3438 § 1, 1983; Ord. 3321 § 1, 1982; Ord. 2500, 1977]. (2) That the variance is necessary for the proper design and/or function of the project. (B) No variance shall be granted unless the project, with such variance, is consistent with the purpose of this chapter. 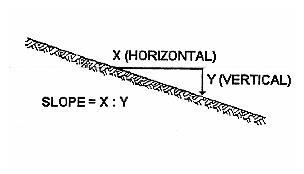 (C) As contemplated in this section, a variance shall be granted for alternative methods of construction for projects which could be constructed under the basic standards established in this chapter, but which, if a variance is granted, can be better and/or more economically designed and constructed than if a variance were not given. A variance shall not be granted if the part of a variance would have the effect of allowing the construction of a project which would otherwise, without the variance, not be possible under the provisions of the County Code. (D) Fees for variances shall be set by resolution of the Board of Supervisors. [Ord. 3438 § 1, 1983; Ord. 3321 § 1, 1982; Ord. 2500, 1977]. (A) Issuance. The issuance of a grading approval shall constitute an authorization to do only that work which is described or illustrated on the application for the approval or on the approved plans and specifications. (B) Plan Checking. The application, plans, and specifications filed by an applicant for an approval shall be checked by the Planning Director within 30 days after receipt of all information required for issuance of the approval. The Planning Director shall notify the applicant in writing 30 days of any deficiencies. The Planning Director or Planning Commission shall approve an application for approval if the plans filed therewith conform to the requirements of this chapter, zoning ordinances, use permit and design review conditions and other applicable laws. (a) That the design of the proposed site is not consistent with the applicable general and specific plans adopted pursuant to Chapters 13.01 and 13.03 SCCC. (b) That the proposed grading plan for the development contemplated does not comply with the requirements of the Santa Cruz County Code. (c) If the project is for the creation of a building site, that adequate sewage facilities and water supplies cannot be provided. (d) If the project as proposed will cause excessive and unnecessary disturbance of the site particularly as defined in SCCC 16.10.050. (2) An application for a grading approval shall be denied if the work proposed would be hazardous by reason of flood, geological hazard, or unstable soils; be liable to endanger other properties or result in the deposition of debris on any public way, property, or drainage course; or otherwise create a hazard. (3) An application for a grading approval which would create unavoidable adverse environmental impact shall be denied. (4) An application for grading in a riparian corridor shall be denied if it is not in conformance with other chapters of the County Code which regulate development activity in riparian corridors. (5) An application for a grading approval to place fill within a 100-year floodplain shall be denied, unless the fill is the minimum amount necessary, not to exceed 50 cubic yards, and it can be demonstrated through environmental review that the fill will not cause significant cumulative impacts. (6) The Planning Director shall notify the applicant in writing of a denial or conditional denial and shall state the reasons therefor. (D) Restriction on Certain Grading Approvals. If the project is for the creation of, or access to, a building site, land disturbance shall not take place until a building permit has been issued. If an approval cannot be issued until a determination of adequate water source and sewage disposal or other required site investigation is made, land disturbance shall be limited to the extent necessary to allow such an investigation. This provision shall not apply to improvements or road construction required as a condition of approval of a minor land division or other permit. (1) Improvement of any existing grading project to bring it up to the standards of this chapter. (2) Requirements for fencing of excavations or fills which would otherwise be hazardous. (3) Haul routes for materials. (4) Conditions recommended by the Environmental Coordinator. (5) Conditions recommended by a geological hazard review. (6) Check dams, cribbing, riprap or other devices which may be required to prevent erosion. (7) Mulching, fertilizing, watering or other methods may be required to establish new vegetation. On slopes less than 20 percent, stockpiling and reapplication of topsoil shall be required, unless it can be shown that adequate erosion control measures, as per the erosion control ordinance (Chapter 16.22 SCCC), can be implemented. (8) Dust from grading operations shall be controlled. (9) No earth or organic material shall be deposited or placed where it may be deposited into a stream, marsh, slough, lagoon or body of standing water in a quantity deleterious to wildlife, aquatic life, or other beneficial uses of the water. (F) Approved Plans. When the Planning Director issues the permit, all of the plans and specifications shall be endorsed “approved.” Such approved plans and specifications shall not be changed, modified, or altered without written authorization by the Planning Director, and all work shall be done in accordance with the approved plans and this chapter. (G) Amendment. Amendments to approvals granted pursuant to this chapter whether for change of project, conditions, or expiration date or other time limits, shall be processed in accordance with the provisions of Chapter 18.10 SCCC. (H) Retention of Plans. One set of plans and specifications shall be retained by the Planning Director for a period of not less than two years from the date of completion of work covered therein. Plans which have been submitted for checking and for which no permit is issued may be destroyed by the Planning Director if not picked up by the applicant within 90 days. (I) Posting of Permit. At the time a grading permit is issued, the County shall also issue the permittee a notice of permit form or forms. The permittee shall cause such form or forms to be posted on the property at a place at which such form or forms can easily be seen from any public or private road or from adjacent properties during any time that grading is taking place on the property. A copy of the plans shall be attached to the notice of permit or, in lieu thereof, a brief description in writing and diagrams of the permitted grading. (J) Work Time Limits. The permittee shall fully perform and complete all of the work required to be done within the time limit specified. If no time limit is specified, the permittee shall complete the work within 180 days after the date of the issuance of the grading permit. If the permittee is unable to complete the work within the specified time, he shall, prior to the expiration of the permit, present in writing a request for an extension of time, setting forth the reasons for the requested extension. If, in the opinion of the Planning Director, an extension is warranted, additional time may be granted for the completion of the work. (K) Working Hours. Hours of grading operation shall be between 7:00 a.m. and 6:00 p.m. on weekdays. No grading shall be permitted on Saturdays, Sundays, and holidays, unless specifically authorized as part of a variance approved by the Planning Director. (L) Expiration. Unless otherwise specified, approvals issued pursuant to this chapter shall expire one year from the date of issuance if not exercised. Where approvals are issued in conjunction with a development permit granted pursuant to Chapter 18.10 SCCC the approval shall expire in accordance with the provisions of Chapter 18.10 SCCC. (M) Safety Precautions. The permittee shall take all appropriate and necessary precautions to protect adjacent public and private property from damage that may result from the operations. (N) Property Lines. Whenever the location of a property line is in question as the result of or during operations, the Planning Director may require any boundary evidence which the Planning Director deems necessary. The Planning Director may require the applicant to furnish a parcel survey. (O) Inclement Weather and Winter Grading. The Planning Director shall stop grading during periods of inclement weather when weather-generated problems are not being controlled adequately. No grading shall occur during the winter season (October 15th through April 15th), unless authorized in advance by the Planning Director with reference to the erosion control ordinance. (P) Validity. The issuance or granting of approval of plans and specifications shall not be construed to be approval of any violation of any of the provisions of this chapter or of any other law. The issuance of an approval based on plans and specifications shall not prevent the Planning Director from thereafter requiring the correction of errors in plans and specifications or from preventing operations from being carried on when in violation of this chapter or of any other law. (Q) Suspension or Revocation of Approval. The Planning Director may, in writing, suspend or revoke an approval issued under provisions of this chapter whenever the approval is issued in error or on the basis of incorrect information supplied, or in violation of any law or regulation or any of the provisions of this chapter. [Ord. 3599 § 5, 1984; Ord. 3438 § 1, 1983; Ord. 3321 § 1, 1982; Ord. 2500, 1977]. Applications for grading approvals shall be submitted to the Environmental Coordinator pursuant to Santa Cruz County environmental impact regulations. [Ord. 3438 § 1, 1983; Ord. 3321 § 1, 1982; Ord. 2500, 1977]. Whenever the Planning Director determines that an excavation, embankment, or fill has become a hazard to life and limb, endangers property, or adversely affects the safety, use, or stability of a public way or drainage channel, he shall notify in writing the owner(s) of the property or other person or agent in control of the property on which the hazard exists. On receipt of the notice, the owner(s) shall within the period specified eliminate the hazard and bring the property into conformance with the requirements of this chapter. [Ord. 3321 § 1, 1982; Ord. 2500, 1977]. (1) Restoration purposes, including the protection and enhancement of existing harbors. (2) Nature study, aquaculture, or similar resource-dependent activities. (B) Diking, filling, and dredging in existing estuaries and wetlands is permitted only if it is determined that such activities will maintain or enhance the functional capacity of the wetland or estuary, as determined by the County Environmental Coordinator. (C) The dredged material shall be redistributed into the same littoral cell from which it was taken. The deposition of such dredged materials must be timed and located so as not to interfere with shoreline processes, longshore current systems, and public use. [Ord. 3438 § 1, 1983; Ord. 3321 § 1, 1982; Ord. 2500, 1977]. A grading approval shall be required for all shoreline protection structures which involve the placement of rocks, blocks, or fill material in the coastal hazard zone, including the placement of less than 100 cubic yards of material and maintenance and repair. The design of the proposed structure shall conform to the County’s geologic hazard ordinance, Chapter 16.10 SCCC, as determined by the Planning Director. Information including, but not limited to, geologic reports, engineered plans, beach sand profiles and structural profiles shall be required as deemed necessary by the Planning Director. [Ord. 3438 § 1, 1983; Ord. 3321 § 1, 1982]. (A) Emergency grading approvals may be granted at the discretion of the Planning Director when a sudden, unexpected occurrence involving a clear and present danger demands immediate action to prevent loss of or damage to life, health, property or essential public services. The emergency permit shall conform to the objectives of this chapter and the geologic hazards ordinance, Chapter 16.10 SCCC. The Planning Director may request, at the applicant’s expense, verification by a qualified professional of the nature of and solutions to the emergency situation. (B) The emergency work authorized under this approval shall be limited to necessary activities to protect the endangered structure or essential public structure. The emergency approval shall be voided if the approval is not exercised within 15 days of issuance. The approval expires 30 days after commencement of work. Any work completed outside of these time periods requires a regular grading approval unless an extension is granted by the Planning Director. (C) At the time of application for an emergency approval or within 60 days of issuance of the emergency approval the applicant shall submit a completed application and the appropriate fees for a regular approval. (D) Within 90 days of the issuance of an emergency approval, the owner of the property shall submit all required technical reports and project plans unless a time extension is granted by the Planning Director. If the information described above is not submitted within the specified time, the emergency approval shall be voided and the emergency work shall be considered a violation of this chapter. (E) If the emergency work is required during nonbusiness hours, the property owner shall submit an emergency grading permit application on the following business day. [Ord. 3599 § 6, 1984; Ord. 3438 § 1, 1983; Ord. 3321 § 1, 1982]. Fees for processing grading approval application and requests for variances shall be set by resolution of the Board of Supervisors. (A) Grading Approval Fees—Subdivision. No plan-checking or grading approval fees shall be charged for a grading approval for property for which a final subdivision map has been recorded (or a tentative subdivision map has been approved subject to a specific condition that grading will be permitted prior to recording of the final map); provided, that all of the contemplated grading is shown on approved improvement plans pursuant to Chapter 14.01 SCCC. Costs for plan checking and construction inspection for compliance with this chapter shall be determined in the same manner as fees provided in SCCC 14.01.506. [Ord. 3438 § 1, 1983; Ord. 3321 § 1, 1982; Ord. 2500, 1977]. Approvals for grading shall not be valid and work shall not be started until the required securities have been provided. Securities shall remain in effect one winter after final inspection and approval. All expenditures by the County for corrective work necessary because of the permittee’s failure to comply with the provisions of the approval and this chapter shall be charged against the security. (A) If a grading is in excess of 2,000 cubic yards the permittee shall provide a cash deposit, time certificate of deposit, or equivalent security, acceptable to the County, payable to the County to insure compliance with the provisions of the approval and this chapter. (B) If deemed necessary by the Planning Director, a similar security, acceptable to the County, may be required for grading operations of less than 2,000 cubic yards. (1) Two thousand to 10,000 cubic yards: $0.50 per cubic yard, plus the cost of drainage or other protective devices. (2) Ten thousand and one cubic yards or more: $5,000 plus $0.25 per cubic yard for each additional cubic yard in excess of 10,000, plus the cost of drainage or other protective devices. (D) No separate grading security except for security required for winter grading operations shall be required for work on which a final subdivision map has been recorded (or a tentative subdivision map has been approved subject to a specific condition that grading will be permitted prior to recording of the final map); provided, that all of the contemplated grading is shown on approved improvement plans pursuant to Chapter 14.01 SCCC and the amount of the subdivision improvement, performance, labor and material securities is sufficient to cover all grading. (E) A separate security for any grading operations authorized during the winter, between October 15th and April 15th, may be required if deemed necessary by the Planning Director. [Ord. 3599 § 7, 1984; Ord. 3438 § 1, 1983; Ord. 3321 § 1, 1982; Ord. 2500, 1977]. (B) Drainage and Terraces. Drainage and terraces shall be provided as required by SCCC 16.20.170. (C) Vegetation Removal. No vegetation removal or grading pursuant to a permit will be allowed which will result in erosion. Vegetation removal shall conform to SCCC 16.22.080. [Ord. 3321 § 1, 1982; Ord. 2500, 1977]. (A) General. Unless otherwise recommended in the soil engineering report approved by the Planning Director, fills shall conform to the provisions of this section. (B) Fill Location. Fills shall not be constructed on natural slopes steeper than two to one unless a civil engineer devises a method of placement which will assure the fill will remain in place. 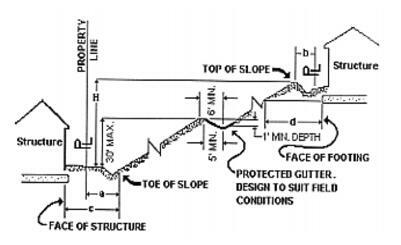 The toe of a fill shall be no closer than 12 feet horizontally to the top of existing or planned cut slopes (See Figure 3). (C) Preparation of Ground for Fill. The ground surface shall be prepared to receive fill by the removal of topsoil and other unsuitable materials and by keying into sound bedrock or other suitable material. (D) Material Permitted. Earth material free from tree stumps, organic matter, trash, sod, peat and similar material shall be used in fills. Rock, cobbles, and similar material shall be distributed and not nested or piled together, and pieces larger than 12 inches in greatest dimension shall not be used unless a method of placement is approved by the Planning Director. Organic material may be used in the top 12-inch layer of fills to aid plant growth. (E) Fill Slopes. No fill shall be made which creates an exposed surface steeper in slope than two horizontal to one vertical. The Planning Director may allow a steeper slope or require a flatter slope if he finds this consistent with stability and safety. (F) Compaction of Fills. All fills shall be compacted to a minimum of 90 percent of relative maximum density as determined by ASTM D-1557-70, or CALTRANS test method number California 216. Compaction tests may be required. (G) Drainage and Terraces. Drainage facilities and terraces shall be provided as required by SCCC 16.20.170. [Ord. 3321 § 1, 1982; Ord. 2500, 1977]. Unless otherwise recommended in the approved engineering report and shown on the approved grading plans, the tops and toes of cut and fill slopes shall be set back from property boundaries and structures, as per Table C and the riparian corridor protection ordinance (Chapter 16.30 SCCC). [Ord. 3321 § 1, 1982]. (A) General. Drainage facilities and terraces shall conform to the provisions of this section unless otherwise indicated on the approved permit and grading plan. (1) Existing drainage courses shall not be obstructed and alterations to them must conform to the provisions of this section. (2) Drainage facilities shall be provided to carry surface and subsurface waters to the nearest drainage course designated for such purpose by the Planning Director or on-site dry wells. Discharge of waters onto natural ground may be allowed only if a suitable means is provided for reducing the velocity of flow to prevent erosion. (3) Culvert sizes shall be in accordance with “County Design Criteria, Part 2, Storm Drainage.” Minimum diameter shall be 12 inches. Culvert material shall be clay, cast iron, cast-in-place or pre-cast concrete, corrugated steel, aluminum, asbestos-cement or other materials approved by the Planning Director. (4) Cuts, fills, and retaining walls shall have subsurface drainage facilities if necessary for stability. (5) Gutters, berms and/or culverts may be required for roads and driveways to control water runoff. (6) Berms, ditches, or swales shall be constructed at the top of cut and fill slopes for protection against water runoff. (1) Terraces shall be at least six feet wide. (2) All swales or ditches on drainage terraces shall be graded to provide suitable drainage and designed to prevent erosion. (3) Swales or ditches which collect water from a tributary area exceeding one-third of an acre (measured horizontally) shall have down drains. [Ord. 3321 § 1, 1982; Ord. 2500, 1977]. (A) All private road and driveway construction requiring a grading approval shall conform to the provisions of this section. These requirements may be modified for emergency access, temporary roads, or roads leading to an agricultural building or well site if approved in writing by the Planning Director. (B) Width of roadbed for a roadway shall be 16 feet minimum; width of a driveway shall be 12 feet minimum. Where it is environmentally infeasible to meet these criteria (due to excessive grading or tree removal), a 12-foot-wide all-weather road with 12-foot-wide by 30-foot-long turnouts located approximately every 500 feet may be approved with the approval of the fire department. The distance between turnouts may be adjusted at the discretion of the Planning Director if deemed appropriate for reasons of topography, environment or emergency access. (D) The maximum grade of the road or driveway shall not exceed 15 percent; however, grades of up to 20 percent are permitted for up to 200 feet at a time. (E) The structural section shall consist of a minimum five inches of baserock, Class II or Class IV. Class IV aggregate base should have a minimum R value of 50, and not more than 10 percent of the aggregate shall pass the number 200 sieve. (F) Where the subgrade is designated as an expansive clayey soil, the structural section should be determined using the California Design Procedure. (G) The aggregate base required by these design standards can be omitted if the Planning Director determines that the native material provides sufficient bearing capacity for all weather use. (I) Asphalt or concrete berms or their equivalent may be required to control drainage. Discharge shall be at points of natural drainage courses with energy dissipaters installed where necessary to prevent erosion. (J) Entrances from private roads or driveways into private roads shall be limited in gradient as shown by Figure 4. (K) Any roadway or driveway which is more than 300 feet long and a dead end shall have a turn-around area with a minimum of 32 feet radius, or equivalent. (L) A horizontal clearance of 16 feet and a vertical clearance of 14 feet shall be maintained on all roadways, driveways, and turnouts. (M) Where a private driveway will connect to a County-maintained road, an encroachment permit shall first be obtained from the Public Works Department. [Ord. 4678 § 1, 2002; Ord. 4578 § 5, 1999; Ord. 3599 § 8, 1984; Ord. 3438 § 1, 1983; Ord. 3321 § 1, 1982; Ord. 2500, 1977]. (1) Existing and proposed drainage pattern. (2) Estimate of earth to be moved. (3) Property map with graded area shown. (4) Erosion control measures to be taken on disturbed noncrop areas, including long-term maintenance. (5) Cross-sections of the proposed grading project. Applications for grading for access roads and for building sites, except greenhouse sites, shall not be processed under this section. (1) On-site water retention (ponds). (2) Grading with major erosion potential. The conditions of the design or review shall be part of the permit. (C) Special Review. The Planning Director can require review of the project by the Agricultural Policy Advisory Commission. (D) Design Standards for Agricultural Grading. Specifications of design for agricultural grading shall be consistent with agricultural practices and needs, and shall assure slope stability, soil conservation, and flood hazard protection. Reference to agricultural grading may be recorded in the deed. (E) Approval Processing. Agricultural grading approvals shall be processed within 30 days of receipt. Provisions should be made for emergency processing at the discretion of the Planning Director. (F) Fees and Bonds. The fee for agricultural grading approvals shall be set by resolution of the Board of Supervisors. No surety bonds are required. [Ord. 3438 § 1, 1983; Ord. 3321 § 1, 1982; Ord. 2972, 1980]. (A) Inspection. The following inspections shall be performed by the Planning Director. (1) Pre-Site Inspection. To determine the suitability of the proposed grading project. (3) Final Inspection. To determine compliance with plans and specifications. (B) Notification. The permittee shall notify the Planning Director 24 hours prior to the start of the authorized work and also 24 hours prior to any inspection requested by permittee or permittee’s authorized agent. (C) Right of Entry. The filing of an application for a grading approval constitutes a grant of permission for the County to enter the development area for the purpose of administering this chapter from the date of the application to the termination of the erosion control maintenance period. If necessary, the Planning Director shall be supplied with a key or lock combination or permitted to install a County lock. (D) Final Inspection. Final inspection and approval of the building permit, development permit or parcel approval shall not occur until the project is in compliance with all of the grading approval conditions and all of the provisions of this chapter. [Ord. 4281 § 12, 1993; Ord. 3599 § 9, 1984; Ord. 3438 § 1, 1983; Ord. 3321 § 1, 1982; Ord. 2500, 1977]. (A) It shall be unlawful for any person to do, cause, permit, aid, abet, suffer or furnish equipment or labor for any grading as defined in SCCC 16.20.030 unless (1) a development permit has been obtained and is in effect which authorizes the grading, or (2) the grading is exempt from the requirement for a permit by the provisions of SCCC 16.20.040 and the provisions of Chapter 13.20 SCCC. (B) It shall be unlawful for any person to do, cause, permit, aid, abet, suffer or furnish equipment or labor for any diking, dredging, or filling of open coastal water above the ordinary high water line, or of wetlands, lagoons, estuaries, or lakes unless a development permit has been obtained and is in effect which authorizes such activities. (C) It shall be unlawful for any person to do, cause, permit, aid, abet, suffer or furnish equipment or labor for any shoreline protection structures which involve the placement of rocks, blocks, or fill material in a coastal hazard zone unless a development permit has been obtained and is in effect which authorizes such activities. (D) It shall be unlawful for any person to exercise a development permit which authorizes grading without complying with all of the conditions of such permit. (E) It shall be unlawful for any person to refuse or fail to abate a hazardous condition as required by a notice of hazardous condition issued by the Planning Director under the provisions of SCCC 16.20.100. (F) It shall be unlawful for any person to knowingly do, cause, permit, aid, abet or furnish equipment or labor for any work in violation of a stop work notice from and after the date it is posted on the site until the stop work notice is authorized to be removed by the Planning Director. (G) If the Planning Director determines that any grading occurring in the County does not comply with the development permit or this chapter, he may stop all work until corrective measures have been completed. The site shall be posted with a “stop work” notice. No building, septic tank, encroachment or other permit shall be issued by the County, and the County may require that all work shall be stopped pursuant to any such permits issued, until corrections have been made to the satisfaction of the Planning Director. (H) Whenever the Planning Director determines that grading has been done without the required development permit, he may refuse to issue a permit for the work already completed and require mitigating action. [Ord. 3451-A § 11, 1983; Ord. 3438 § 1, 1983; Ord. 3321 § 1, 1982; Ord. 2500, 1977]. If the civil engineer, the soil engineer or the engineering geologist of record is changed during the course of the work, the work may be stopped until the replacement has agreed to accept the responsibility within the area of his technical competence for approving the work already accomplished. [Ord. 3321 § 1, 1982; Ord. 2500, 1977]. If a civil engineer or another professional licensed by State law prepared the grading plans, he shall provide a written statement to the Planning Director that all grading was completed in conformance with the provisions of the permit and this chapter. [Ord. 3321 § 1, 1982; Ord. 2500, 1977]. 16.20.240 Recording notice of violation. Repealed by Ord. 4392A. [Ord. 3438 § 1, 1983; Ord. 3321 § 1, 1982]. 16.20.250 Removal of notice of violation. Repealed by Ord. 4392A. [Ord. 3321 § 1, 1982]. All appeals of actions taken pursuant to the provisions of this chapter shall be made in conformance to the procedures of Chapter 18.10 SCCC. [Ord. 3438 § 1, 1983; Ord. 3321 § 1, 1982; Ord. 2500, 1977].